There is NO study hall during the lead up to the mocks whilst I’m away. I expect SL and HL to be in attendance for all lessons. Exam covers all topics 1-11 except topic 8 (Acids and Bases). Option D – medicines and drugs is also not covered! No calculator or data booklet but you do get a periodic table. This section will include a data question ie calculation! Read all three questions during reading time and decide which one you will do. You have a choice from 3 questions. Data booklet supplied and calculator allowed. Exam covers all topics 1-21 except topics 8,18 (Acids and Bases). Option D – medicines and drugs is also not covered! Read all three questions during reading time and decide which one you will do. You have a choice from 4 questions. Finish your final IA and submit it to Turn-It-In by Friday 13th! You will be working through the following papers as revision. Try and do them under test conditions at first, then mark them and practise the questions you couldn’t do. Extra questions can be found on the google+ community separated into topics. Review and take notes from the following videos to finish off topic 18 Acids and Bases. No more calculations here! Yay! Take a note of any questions you have about the videos and we will review them after your mock exams. This entry was posted in Grade 12 Chemistry on February 5, 2015 by Merilyn Winslade. Finish your assessment task from Friday. Submit this to Turn-It-In by the end of the class. 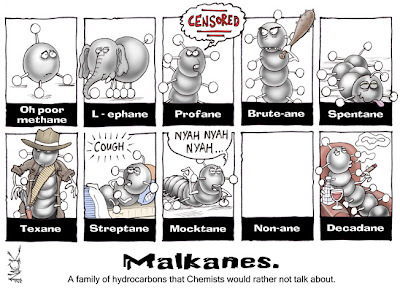 Now it is time to practise naming and drawing a few more alkanes! Draw all the structural isomers of heptane C7H16 and then try and name them.Hint – You can use this video or these written instructions to help you if you’ve forgotten what to do.Apart from heptane, there should be eight other isomers. See if you get them all as a class! Make a brief summary of the main points in your notebook. Answer the questions 1-5 on page 175. Finish anything you didn’t complete yesterday before beginning today’s work. Now read page 170-171 in the text. Answer questions 1-5 on page 171 in your notebook. Using the terms evaporation and condensation, write a paragraph to explain how kerosene is separated from crude oil. Finish anything you haven’t completed in the previous two lessons before beginning today’s work. In your notebook, answer the question 1-6. Check with a partner to make sure you agree on the answers. If you can’t do something, look it up! Click on this link to start a lesson on polymers and plastics. Discuss the question posted on the discussion board. Comfortable with everything? Here’s a documentary called “Addicted to Plastic”. Enjoy! This entry was posted in Grade 10 Science and tagged Cover on February 4, 2015 by Merilyn Winslade. Here is what you need to complete during Monday’s double period. Log in to BrainPop using the nine dots! Take the quiz and submit results to me on a spreadsheet! You need to get at least 8/10 before going to the next activity. After you have become an expert on the digestive system, choose the “Make-a-map” option. Arrange the images in the correct order and label them to make a map of how the digestive system works.You do not need to include every image and every keyword in your diagram. Just use the ones that make sense to you.Here is an example of the concept map I began. You could start yours like mine or choose to do it totally differently. Save your finished map and submit to teacher. Finished? Need more? Watch the movie below. Read pg 8 of Spotlight Science 8. In your notebook, put the heading Digestion. Answer question 1 in your notebook. 7A(nimals) – Here is what you need to complete on Wednesday’s double period. Log on to BrainPop using the nine dots. Take the quiz and send the results to me via a spreadsheet. You need to get at least 8/10 before you proceed to the next step. Many people choose different diets for different reasons. For example, some people are allergic to certain foods. Some people don’t eat certain foods for ethical reasons. These people still need to eat a balanced diet. Answer the questions based on the diet you choose to investigate. a) What foods are excluded (not eaten) on this diet? b) What nutrients are these foods (in part a) a major source of? c) Give a suggestion for what foods could be eaten instead of those in part a) so that people on this diet would still have a balanced diet. Finished? Need more to do? Explore BrainPop for other videos on digestion and nutrition. If you find a good one, share it with the class! This entry was posted in General, Grade 7 Science and tagged Cover, digestion, nutrition on February 4, 2015 by Merilyn Winslade.